On March 21st, hundreds of thousands will gather in Washington, DC for the March for America, demanding “immigration reform for new American families and economic justice for all American families.” You can see earlier posts on the importance of immigration reform for the Sikh community here and here. In the spirit of Sikh activism and sarbat da bhala, we encourage community members to join the march in Washington on the 21st. Today we are at a pivotal moment in the history of this nation. We are faced with a choice. We can do nothing, and watch as our families and communities continue to be torn apart by the broken immigration system; watch as profiteers continue to take advantage of people desperate for work; watch as due process is taken away from our understanding of justice; and watch as our leaders work on economic solutions that simply aren’t bold enough to turn this country around. Or we can stand up for our families and our communities. 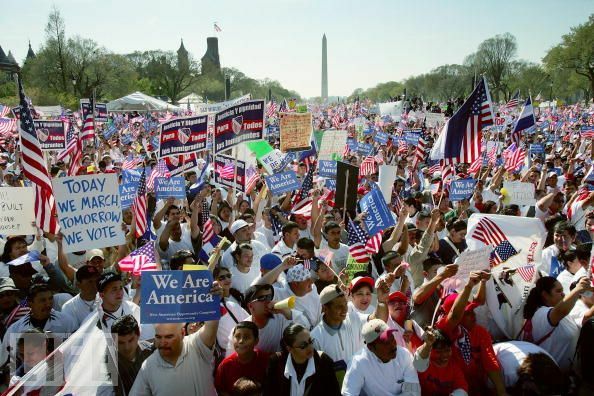 Join thousands from across the country at the March For America in Washington DC on March 21st. It is up to us. Please click here for more information about the march, including transportation. Buses will be making one-day trips from New York City and other East Coast cities. Contact sonny@sikhcoalition.org if you want to get on a bus in New York. This entry was posted on Wednesday, March 10th, 2010 at 12:21 pm and is filed under Community Organizing, Legislative Advocacy. You can follow any responses to this entry through the RSS 2.0 feed. Both comments and pings are currently closed.